Vancouver, British Columbia--(Newsfile Corp. - March 4, 2019) - Dunnedin Ventures Inc. (TSXV: DVI) (the "Company" or "Dunnedin") today announced it has entered into a letter of intent to acquire 100% of the Mohave copper-molybdenum-silver porphyry project ("Mohave") in Yavapai County, Arizona, USA, from Bluestone Resources Inc. The Mohave acquisition represents a strong addition to Dunnedin's copper portfolio in North America which also includes Dunnedin's 100%-owned Trapper and MPD copper porphyry projects in British Columbia, Canada. Mohave has the potential to host a large-scale copper porphyry deposit with silver and molybdenum credits. Its geology is considered analogous to Freeport McMoran's (NYSE: FCX) Bagdad copper porphyry mine which is located approximately 33 km to the east of Mohave. "Mohave enhances Dunnedin's copper portfolio with a US-based asset located in a prolific copper mining district," said Claudia Tornquist, President of Dunnedin. "Investor sentiment in the United States favours domestic resource production, thus developing a copper project at Mohave is anticipated to have strong appeal. 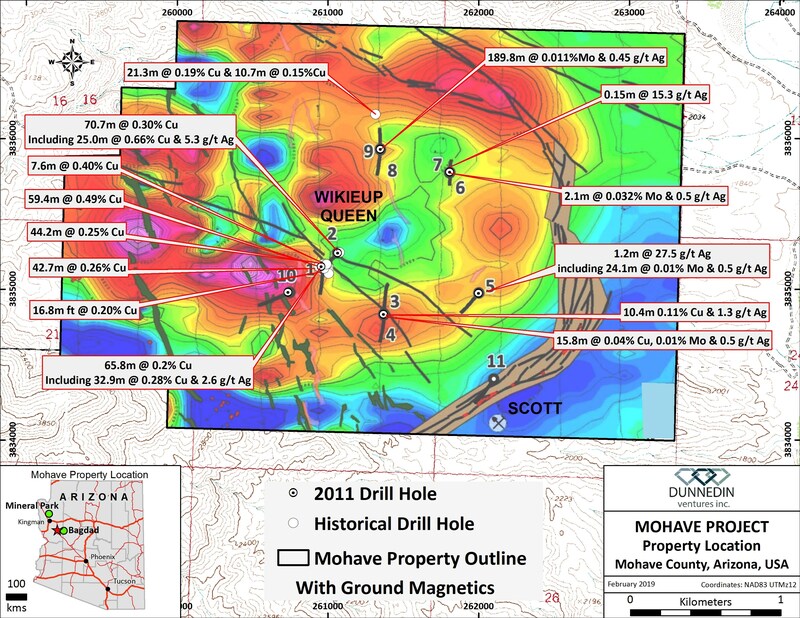 Mohave is an underexplored property with nearby producing mines and excellent infrastructure. Previous drilling has confirmed porphyry style copper-molybdenum-silver mineralization. Significant copper-in-soil targets have been historically defined and remain untested. With three copper assets in British Columbia and Arizona, Dunnedin will now be able to drill year-round. Our first drill program will be at our MPD Project in Southern British Columbia in early 2019 and we are starting preparatory work immediately for a drill program at Mohave later in in the year." A 0.5% net smelter returns royalty on the Mohave Claims and on a 2 km area of interest around the Mohave Claims. Including the royalty newly granted in this transaction Mohave is subject to a 3.5% net smelter return royalty of which 1% can be bought back for US$1,000,000. Management will provide further information on 2019 exploration plans at Mohave as the project database is analyzed. Dunnedin has also granted an aggregate of 1,700,000 stock options to management, directors and consultants of the Company, exercisable at C$0.075 per share for a period of five years. Management cautions that Dunnedin has not performed any exploration on the Mohave Project to date. Historic information reported herein was obtained from publicly available and industry related reports. This news release contains historic data that Dunnedin believes to be from reliable sources using industry standards at the time, but the Company has not independently verified, or cannot guarantee, the accuracy of the information disclosed, and readers should use caution in placing reliance on such information. Comparisons to adjacent or similar mineral properties, deposits and mines are provided for information purposes only. Dunnedin has no interest in, or rights to explore or mine any such properties and references to deposits and reserves reported herein are not indicative of deposits or results obtained on the Company's properties. Dunnedin Ventures Inc. (TSXV: DVI) is focused on its 100% owned, advanced-stage Kahuna Diamond Project in Nunavut which hosts a high-grade, near surface inferred diamond resource and numerous kimberlite pipe targets. The Company holds diamond interests in 1,664 km2 of mineral tenure located 26 kilometres northeast of Rankin Inlet and adjacent to Agnico Eagle's Meliadine gold mine. The Kahuna Diamond Project has an Inferred Resource Estimate of 3,987,000 tonnes at an average grade of 1.01 carats per tonne, totalling over 4 million carats of diamonds (+0.85 mm) (see news release dated March 31, 2015). Dunnedin's drilling is aimed at the discovery of diamondiferous kimberlite pipes, and the Company is working with advisor and largest shareholder Dr. Chuck Fipke to define and prioritize drill targets based on an extensive historic data set, and diamonds and indicator minerals recovered from a series of kimberlite and till samples over four seasons of field work. Dunnedin also holds 100% interests in the Trapper Porphyry Project in the northern "Golden Triangle" region of British Columbia, and the MPD Project in south-central British Columbia near Princeton. The Trapper and MPD Projects are interpreted to overlie gold-rich copper porphyry systems having surface geochemical, geophysical and regional alteration signatures of considerable size. Based in Vancouver, Dunnedin is backed by a world-renowned team of exploration experts with decades of combined exploration experience and significant capital market strength. Statements included in this announcement, including statements concerning our plans, intentions and expectations, which are not historical in nature are intended to be, and are hereby identified as, "forward-looking statements". Forward-looking statements may be identified by words including "anticipates", "believes", "intends", "estimates", "expects" and similar expressions. The Company cautions readers that forward-looking statements, including without limitation those relating to the Company's future operations and business prospects, are subject to certain risks and uncertainties that could cause actual results to differ materially from those indicated in the forward-looking statements. Accordingly, readers should not place undue reliance on forward-looking statements. Forward-looking statements contained herein are made as of the date of this news release and the Company disclaims any obligation to update any forward-looking statements, except as required by applicable securities laws.